By their very nature, SSDs deliver performance beyond what any spinning hard drive is capable of. Data is stored and retrieved using electrical impulses rather than mechanical heads that need to be moved into position over magnetic platters. However, not all SSDs are created equally. There are vastly different grades of the NAND flash that is used for storage, and different ways to connect SSDs inside computers. The most common models are designed to be swapped in for standard hard drives, and use exactly the same connectors – they’re even the same physical size even though they don’t need to be, just to maintain compatibility. Their performance is constrained, but they’re still miles ahead of hard drives. If you want to do even better, you can bypass the SATA storage subsystem and all the legacy protocols designed for slower hard drives altogether. You can make an SSD talk directly to the motherboard and CPU using the PCIe bus. Typically used for graphics cards and high-speed connectivity devices, PCIe forms the backbone of all modern computers, linking components and ferrying data and instructions between them. This kind of SSD represents the pinnacle of performance for consumer desktop PCs. That’s exactly where Corsair is aiming with its new NX500 series. These SSDs are meant for enthusisasts, gamers, and high-performance junkies who are willing to spend whatever it takes to get the best possible performance. It takes on Samsung’s mighty SSD 960 Pro and Evo, as well as Intel’s SSD 600p series and the Kingston KC1000 that we recently reviewed. PCIe SSDs generally use the PCIe M.2 form factor, which is now standard on motherboards even in the budget space. Full-sized PCIe cards are less common but have their advantages. For starters, M.2 slots are often buried below other components and so installation as well as cooling can be difficult. Perhaps more importantly, you can use the PCIe lanes connecting directly to the CPU rather than the ones arising from the motherboard’s platform controller (if the CPU in question has enough lanes), which can result in a speed boost and lower latency. The Kingston KC1000 that we reviewed earlier had an M.2 SSD with a PCIe slot adapter, and was trying to be the best of both worlds. 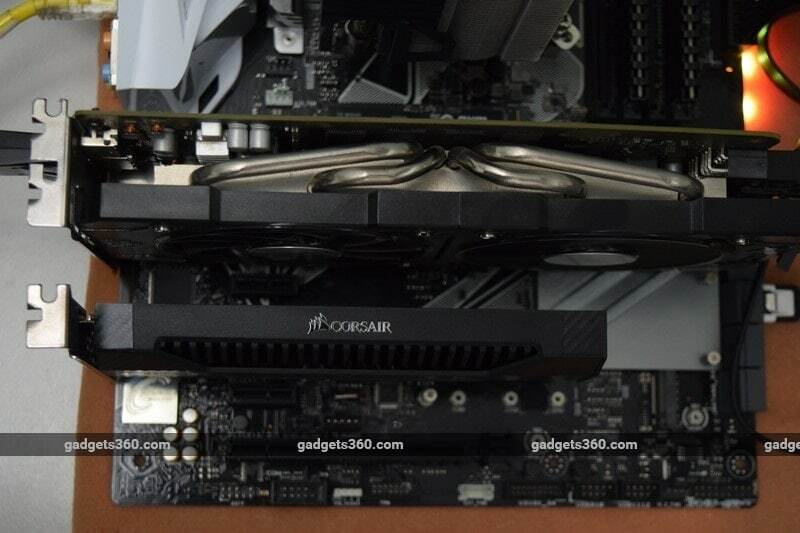 Corsair’s solution is a native PCie card, with its components soldered directly. Even though this is a half-height single-slot card, it feels hefty thanks to the heatsink that covers it completely. It’s debatable whether consumer SSDs really need heatsinks, but it can’t hurt to have one, and it does make this model look like it means business. The black metal fins are surrounded by a plastic frame with a carbon-fibre-like texture. We found that the frame was a bit flimsy and was easy to dislodge, which is a shame. There’s no fan, but you do get patterned vents on the silver rear-facing bracket. The card also has a solid backplate. We can’t tell how much of this is for show, but we aren’t complaining. The only surprise is the lack of RGB LED lighting – the NX500 would be conspicuous in any windowed case, and Corsair is trying very hard to push its Link lighting control ecosystem against rivals from nearly every other player in the industry. You can get the Neutron NX500 in 400GB and 800GB capacities, with a 1.6TB model on the way. It ships in one of the largest boxes we’ve ever seen for an SSD. Even though there’s nothing inside other than the card itself, a half-height bracket, and a small manual, Corsair has tried to make the packaging and presentation look elaborate. This SSD is at the top of Corsair’s product stack, and the company says it is its fastest model ever. Everything about it is designed for high performance. The company uses planar MLC NAND flash which stores two bits per cell, rather than the more common consumer-grade 3D-stacked TLC flash which stores three bits per cell. The controller is an eight-channel Phison E7, which is fairly high-end. Still, semiconductor companies like Samsung and Intel have the advantage of being able to manufacture their own flash and controllers. 400GB and 800GB are odd capacities for SSDs, and that’s because both models actually have larger amounts of flash memory – 512GB and 1TB respectively. Corsair has blocked off a lot of space for what is called over-provisioning. The excess capacity is not exposed to users, but the SSD’s controller can use it to accelerate writes, perform maintenance on itself, and alleviate the wear and tear that eventually affects flash memory cells after thousands of read-write cycles. Most consumer drives have much less over-provisioning, but the NX500 was not designed to be frugal in any regard, and its price reflects that. Note that after formatting, you get 372GB of usable space on the 400GB model. Speed is rated at up to 2.8GBps for sequential reads, and 1.6GBps for sequential writes. Endurance is rated at 698TBW, which refers to the amount of data that can be written over the life of the drive before it shows any sign of wear. The warranty is five years, so you could theoretically be able to write nearly 400GB of data to this drive every day for five years and you still wouldn’t have to worry. Corsair’s website also lists ranges for temperature, humidity, shock and vibration tolerances, which cover pretty much any imaginable consumer usage scenario. Setup is as easy as plugging the card into an empty motherboard PCIe slot and screwing in the backplate. If you have a slim chassis, you can swap out the backplate bracket in under half a minute. It’s much easier than fiddling with tiny M.2 slots, and there are no SATA or power cables to deal with. We tested the Neutron NX500 with our brand new Intel Core i7-8700K CPU, Asus Prime Z370-A motherboard, and 16GB of Corsair DDR4-3000 RAM. Read and write speeds measured with CrystalDiskMark showed that performance is at par with what Corsair claims. Sequential read and write speeds at a queue depth of 32 were 2835MBps and 1554MBps respectively. The high queue depth saturates the SSD’s controller, and so these scores represent the best-case scenario rather than actual day-to-day usage. Random read and write speeds were 690.1MBps and 658.3MBps respectively. At a queue depth of 1, we were still able to achieve 1206MBps sequential reads and 1112MBps sequential writes. SiSOFT Sandra measured 2.45GBps sequential reads, and 1.45GBps sequential writes. Corsair offers a downloadable utility called SSD Toolbox which shows the Neutron NX500’s health and usage statistics, lets you update its firmware, clone the contents of one drive to another, and securely erase all data. However, it looks like it’s been plucked straight out of the Windows 95 era, and Corsair really needs to do better. We also would have liked better explanations of the clone and wipe operations that could result in total data loss. This SSD definitely belongs at the top end of the market, based on numbers like these. There’s a clear divide between budget SATA drives such as the Kingston A400 or WD Blue, and PCIe models such as the Kingston KC1000 and our workhorse Samsung SSD 950 Pro. The Neutron NX500 lags behind Kingston’s offering in most tests, and while it does beat the Samsung, that model is two years old. Corsair has created a product that is indulgently high-end, right from its packaging and design to its specifications and performance scores. If you’re concerned about getting the highest capacity for your money, this drive isn’t for you. The 400GB model that we tested carries a retail price of Rs. 32,999 while the 800GB model sells for an eye-watering Rs. 54,999. In comparison, Samsung’s 512GB and 1TB SSD 960 Pro drives sell for around Rs. 29,000 and Rs. 47,000 respectively, and their SSD 960 EVO equivalents are a lot more affordable. The Kingston KC1000 costs around Rs. 22,000 for 480GB and Rs. 44,000 for 960GB. 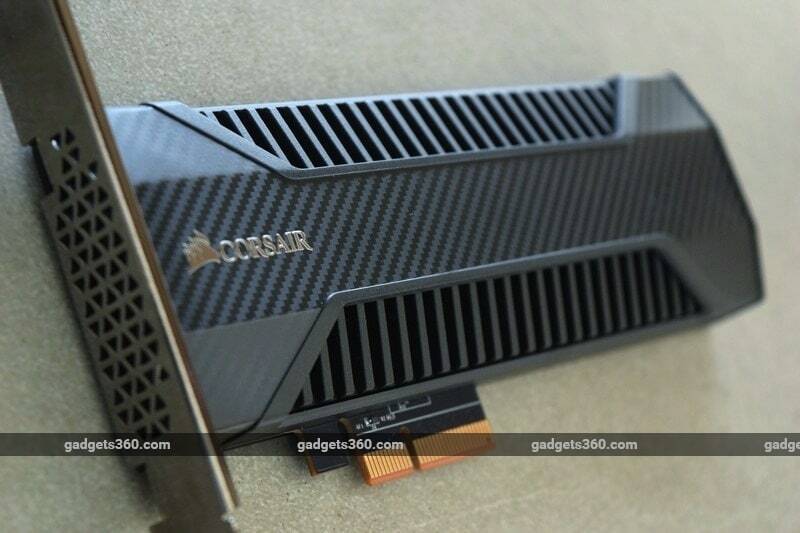 For most people, even those who are happy to spend multiple lakhs on a high-end PC build, there is a point where it doesn’t make sense to buy the absolute best product out there. If the second-best costs a lot less and isn’t worse in any significant way, we have to question whether the marginal utility is justifiable. In our opinion, the Neutron NX500 doesn’t do enough in terms of performance to distinguish itself over its competition. Even if it did top all our benchmark charts, the differences would be hard to detect with real-world usage. Also, if you choose Corsair, you’ll get lower usable capacities at higher prices. You could however be more concerned with the company’s claims regarding reliability and longevity – and while we have no reason at all to doubt the Neutron NX500, we can’t prove anything without running continuous stress tests over the course of several months. Other reasons to choose this drive would be its heavy-duty cooler and its looks. 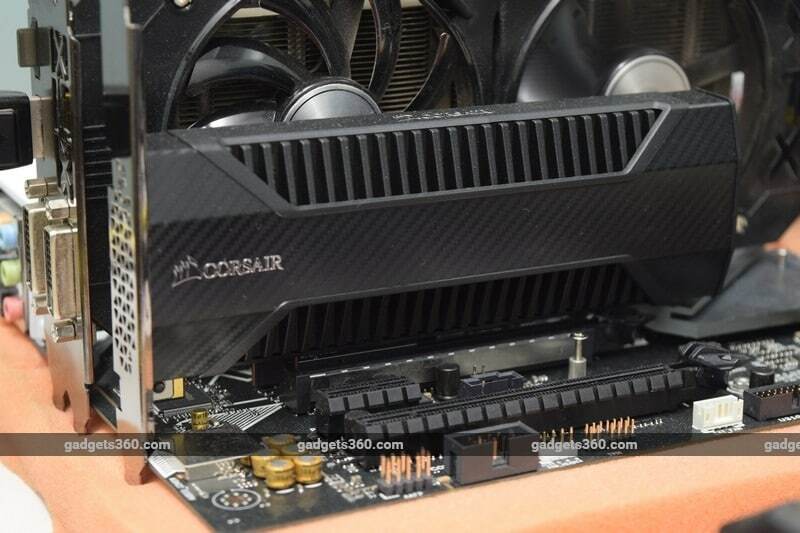 Ultimately, the Corsair Neutron NX500 caters to a niche within a niche, and we’d rather pick up a more affordable alternative and spend the extra money on other components. Best phones in 2017, so far and why we love them?